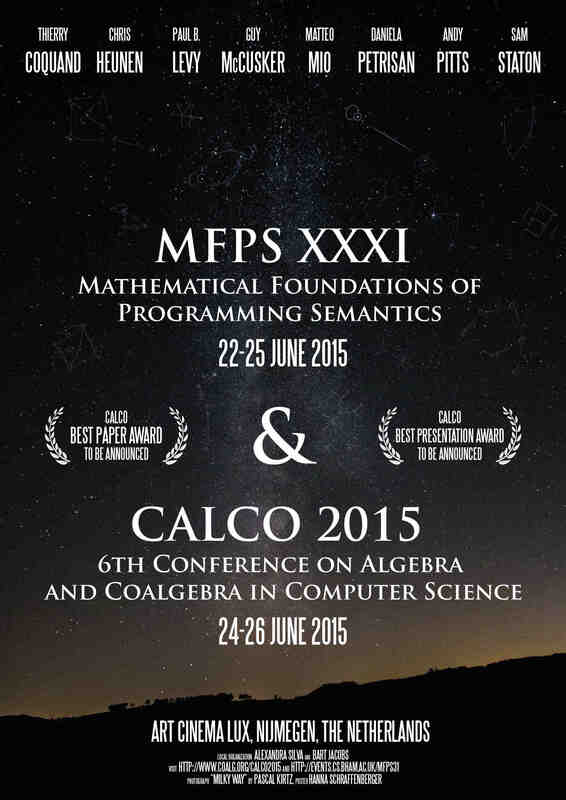 This page contains local information for the conferences Calco 2015 and MFPS XXXI, jointly organised in the week 22-26 June 2015 in Nijmegen, The Netherlands. Getting to Nijmegen University (including nearby airports), and some information about Nijmegen itself. Conference venue Art Cinema Lux (unfortunately only in Dutch), see its location. Note that the conference venue is not at the university campus, but right in the centre of town. Conference dinner, jointly for MFPS and CALCO, on Wednesday June 24, at restaurant De Hucht in Elst (north of Nijmegen), see its location. Conference websites: Calco 2015 and MFPS XXXI. To register for MFPS and/or Calco, please fill out the registration form. The deadline for normal registration is Sunday, June 14. After this date, the late registration fee will be applied. The registration fee can be paid by bank transfer or by credit card (Visa or Mastercard). Payment by bank transfer is strongly encouraged. Within the SEPA area, bank transfers are free of change. You will receive a printed receipt for your payment at the conference itself. SIGLOG members attending MFPS and/or Calco receive a discount on the registration fee: €20 for student members, and €30 for professional members. The yearly rate for SIGLOG membership is $15 for students, and $25 for professionals. You can register for SIGLOG here. The registration fee includes one ticket for the conference dinner. Additional tickets may be reserved for €60 each. Participation in the IFIP WG 1.3 meeting (by invitation only) costs €60, including lunch and dinner. The registration fee can be paid by bank transfer to the account below. Please include the budget number "6200825" and your full name in the description / comment field of your payment, as we need this to match the payment to your registration. Please send your card details to the MfpsCalco Secretariat, by fax at +31 24 3652728, or by email at mfpscalco2015@cs.ru.nl. The amount charged to your card will include a 5% surcharge for credit card payment. We have arranged limited blocks of rooms at four hotels in the vicinity of the conference venue (all within walking distance). Kindly note that city tax is not included in the price and will have to be paid at the hotel directly. The rate is €2,15 per room, per night. The hotel is located next to central station with direct frequent buses to city centre/conference venue. The hotel is holding a block of 40 rooms until Friday, May 22. Rooms are €107 pppn including breakfast. Please mention the conference name at your reservation. This is a hospitable family hotel, located right on the riverside. A block of 15 double rooms has been reserved until Friday, May 22. Some of the rooms overlook the river Waal. Rooms are €80 pppn including breakfast. When making a reservation, please use the code MFPSCALCO2015. This is a small hotel situated in the city centre of Nijmegen. It offers accommodation overlooking the Valkhof Park, shopping centre or river Waal. Single, double and triple rooms available. Optional breakfast. Room rates vary from €52 - €109. Please note: limited rooms available on Sunday, June 21 and Friday, June 26. The MFPSCalco deal is available until Friday, May 22. Please use the code when making a reservation. This hotel is also located in the centre of Nijmegen at the Keizer Karel Square. At walking distance you will find shops, restaurants and bars. The Central station is 400 metres away. The hotel is holding a block of 15 rooms until Thursday, May 21. 3 single rooms: €70 pppn including breakfast; 12 double rooms: €80 pppn including breakfast; double room for single use: €90 pppn. Use the MFPSCalco code when making a reservation. Below is a selection of other hotels or B&B's mostly located in the city centre. Please note that we do not have special deals with them. See for touristic information: VVV Nijmegen.